An intriguing analysis of tactical trends in the Premier League so far this season has shown the new importance of creative full-backs. Left-backs in particular seem to be becoming increasingly important attacking weapons for the big clubs, with the likes of Luke Shaw and Benjamin Mendy shining for Manchester’s big two. Most remarkably, one of the stats in this BBC Sport report has Liverpool’s Andrew Robertson creating as many chances as Arsenal playmaker Mesut Ozil and Manchester United midfielder Paul Pogba put together so far this season. The Premier League website also shows big chances created, with Robertson on three for the season, while Pogba has just one and Ozil zero. While the campaign is only four games old, this is a fascinating look at how teams attack now, and the kind of quality that is required from full-backs in the modern game. It is notable that both of England’s goals in the international break came from assists from both full-backs, with Shaw playing a superb through ball for the first and Kyle Walker’s perfect cross setting up the second. Robertson is undoubtedly one of the finest left-backs in Europe at the moment and he’s clearly so important to this expansive and exciting Liverpool side. 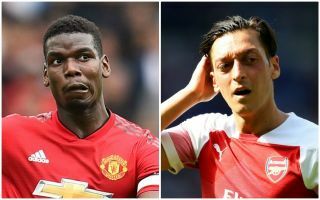 Pogba and Ozil, however, really need to up their performances after slow starts.